A beautiful, gentle sleep oil blend to calm busy minds for rest and relaxation. Safety info – Essential oils should not be used topically on children less than 2 years. Essential Oils should only be used on children highly diluted under supervision of a qualified aromatherapist or medical practitioner. Add 6 drops to water in your vaporiser or oil burner to soothe and comfort. Diffuse up to 1 hour 3 times daily. For bathtime: Add 4–5 drops to 1 cup of Epsom salts for a calming bath. What’s in Sleepy Head Essential Oil? Certified Organic Oils: Lavandula Angustifolia (Lavender), Citrus Aurantium Dulcis (Sweet Orange) Peel, Pelargonium Graveolens (Geranium) Leaf, Cymbopogon Martini (Palmarosa), Citrus Aurantium Bergamia (Bergamot) Peel, Cedrus Atlantica (Cedarwood) Wood, Anthemis Nobilis (Chamomile) Flower. Geranium oil is used to reduce inflammation, alleviate anxiety and balance hormones. 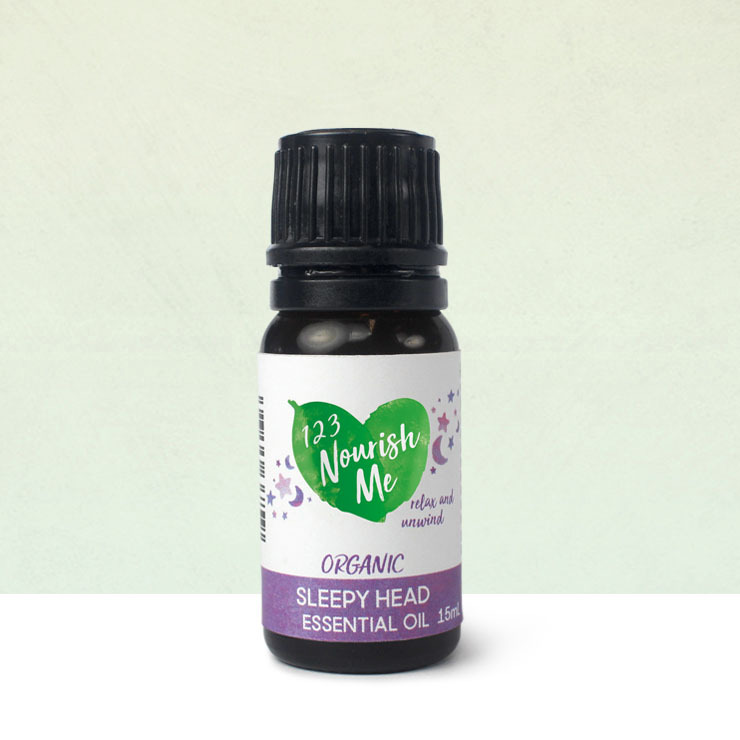 This sweet-smelling oil can also uplift mood, lessen fatigue and promote emotional wellness. Palmarosa essential oil is known to nourish and restores skin health and harmony. It is also known for its ability to rejuvenate tired, sore feet. Having both calming and uplifting effects, it is a tonic for the heart and mind. Cedarwood is known to be one of the best natural sedatives that can help relax your mind and get you the sleep you need. Additionally, the scents released in Cedarwood aromatherapy can help calm down any anxiety or stress that you may be feeling and tone down any depressive thoughts. Chamomile is known to soothe the senses and calm the central nervous system, thus triggering the sleep hormones. Absolutely love these products would highly recommend it to everyone. Great selection of scents… we have it in our bedroom that all of us can benefit from. Thoroughly recommend it!! My 18 month old used to wake 3 or more times during the night. Since we have been using this amazing smelling oil in a diffuser, she has been sleeping through til early morning. Amazing! I LOVE this oil. It arrived a few days ago and smells amazing. I have been using another sleepy oil from a very big MLM company and I pay double for 1/3 of the size so I am super happy with this. In fact, I just stocked up with another 4! Knocks me out and keeps me sleepy all night!! Happy mum over here!!! We use sleeping head oil in our defuser and absolutley love it. We use the sleepy head balm nightly on little miss 3 and use the oil as an added bonus. Just love it. A lovely smell that is part of the bedtime routine of our two kids. They will ask for it themselves when I forget! We love the smell, it’s not too overpowering and perfect when the family is a little stressed! This essential oil smells absolutely divine! We diffuse it each night in our toddler’s room about an hour before he goes to bed and for the first few hours he is asleep. He has been settling off to sleep quickly and without much fuss ever since we have been using it. I highly recommend using this as part of your child’s bedtime routine! This oil and the balm has become a bedtime staple with my two little ones!! My 1yr old has slept so much better since using these products and has gone from waking multiple times a night down to maybe once every now and then!! Just amazing!! My 2 yr old asks for the oil in her “fuser” if I ever forget and loves having the balm rubbed on her, she knows it’s for bedtime and she always says it helps me sleep mum haha, very cute how she has really taken to the products and knows what they’re for. I even do a sneaky and rub the balm on myself once I’m done with the kids sometimes! Thankyou so much for creating these fantastic products that certainly work and my kids love just as much as me!! We have this steaming in the barthroom for our night time shower and barth and hubby absolutely loves it. He says it helps him relax a lot after a stressful day at work and helps him get a good nights sleep. Just love the smell and the way it helps to drift us all off to sleep – not just the little one! I first purchased the balm which was a total life changer in our house! My 2 year old is now in a sleep routine every night, no more exhausting 11pm bedtimes! I then purchased the oil to use in our vaporizer in the living room for when the kids are winding down and it is amazing! My very over stimulated 3.5 year old Kindy kid relaxes and is ready for bed by 7pm! I couldn’t reccomend these products more! Used this oil for the first time last night and l know l will be ordering more. Beautiful calming scent kids were dozing in no time.